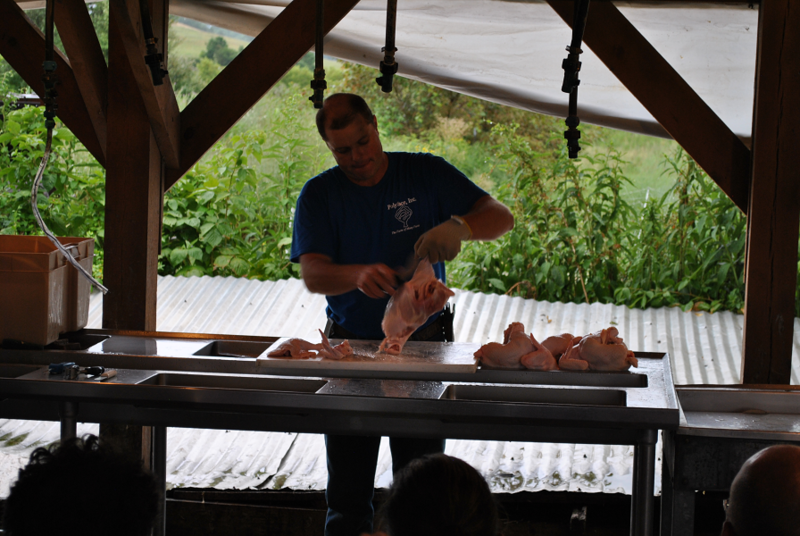 While attending the intensive seminars at Polyface farm, one of the sessions was on cutting up a whole chicken into parts. It’s amazing how many people don’t even know how to cut up a chicken. Today we will go over the process of this seemingly lost skill. When you shop at the grocery store you will see whole chickens, legs and thighs, breast meat and chicken quarters. Not a bad selection, but money can be saved by buying a whole chicken and cutting it up yourself. 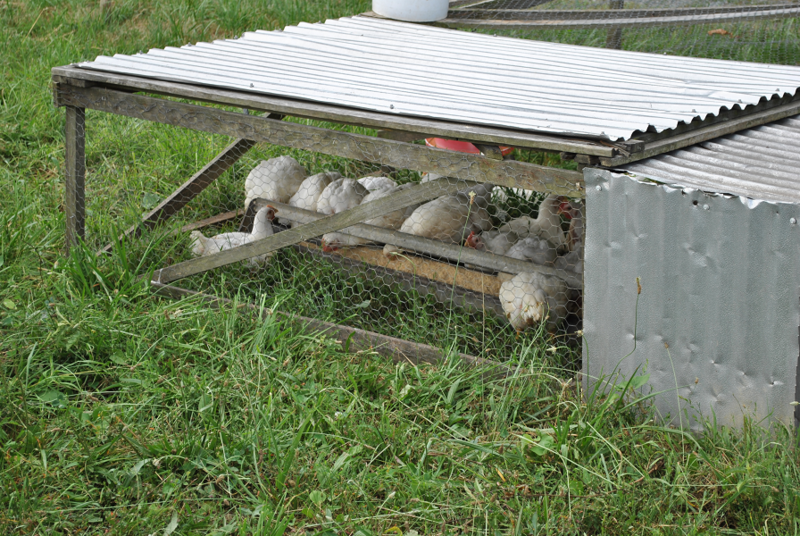 At Polyface, they resisted for many years, selling cut birds. They only sold whole birds. They finally gave into customer demands, but they charge extra for this convenience. Daniel Salatin gave a demonstration on cutting up a whole bird into packaging size quantities. Our concern today is not the mass production of cutting many birds up into serving sizes but just one. Lay the bird on its back. Wiggle or pull the wing to determine where the joint attaches to the breast. To separate the wing from the breast, use a sharp knife to cut through the ball joint where it meets the breast. Repeat with the other wing. Pull a leg away from the body to see where it attaches. To remove the whole leg, first cut through the skin between the thigh and the breast. Continue to pull on the leg and wiggle it a bit to determine where the thigh meets the socket in the back. Use a boning knife to cut through that joint. Repeat with the other leg. Place each leg skin-side down. Flex to see where the ball joint between the drumstick and thigh is located. Look for the thin line of fat that was perpendicular to the body. Cut through the line of fat to separate the thigh and drumstick, wiggling or put tension to find where the joint is. Repeat with the other leg. To remove the back bone, start at the head end of the bird and cut through the rib cage on the one side of the backbone with kitchen shears or sharp knife. Repeat on the other side of the backbone to remove it completely. To cut the breast into 2 halves, place it skin-side down, exposing the breastbone. Use a lot of pressure to cut through the breast bone, right down the center of the breast. Now you have two breast halves. You now have eight pieces of chicken. You can use the parts for stock, stews, frying, grilling or baking. Plus you have saved money and have the desired cuts of meat that you want. A boning knife or pairing knife will give more mobility that a chef’s knife or cleaver. The knife in video is a Vitorinox Forschner boning knife. “How to Cut Up a Whole Chicken.” EatingWell, EatingWell, 10 Feb. 2010, www.eatingwell.com/article/15522/how-to-cut-up-a-whole-chicken/.